Yacht Club Games has come a long way since their Kickstarter. The Shovel Knight series illustrates one of the few successful projects, and we’ve seen nothing but good stuff from their studio since then. The new Shovel Knight expansion is one with a lot of value and charm, and people with a nostalgic itch for a classic platformer on modern consoles will have that itch scratched by Shovel Knight: Specter of Torment. 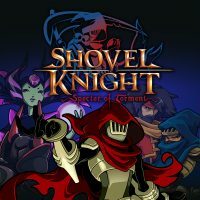 Specter Of Torment is a prequel and second expansion to Shovel Knight. You play as Curios who must convince the other knights to join the Enchantress’ Army. Hone your scythe skills as you tread towards completing your mission. Curios is a Specter Knight who uses his scythe to defeat enemies and reach high places. The scythe allows you to kill enemies while also using it as a crutch to jump off of. The Dash Slash ability can soar you into the air or make the perfect landing onto a moving platform, and you can utilize this skill to jump across large chasms and reach your goals. Remember playing older games and being frustrated by the unfair difficulty? 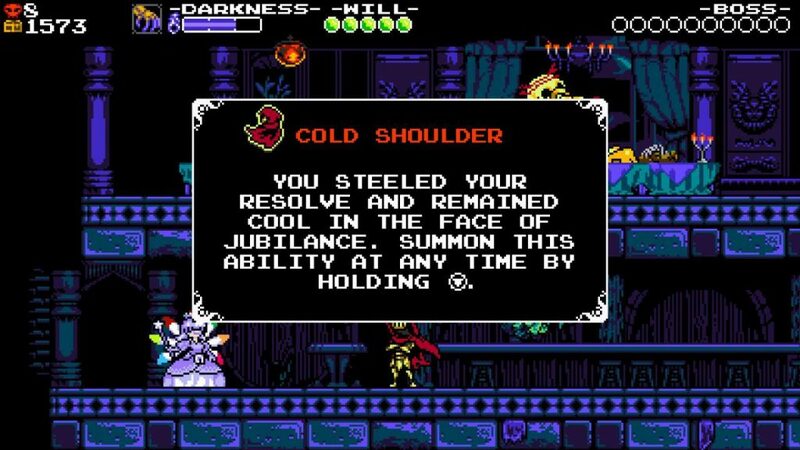 Specter of Torment’s equipment system allows you to adjust to your play style. Every piece of armor allows you to change the rules of gameplay. For example, any touch of the spikes is an instant death. If you feel like you’re having a hard time of avoiding them, you can purchase armor that allows you to surf on your scythe to negate damage. Perhaps you are falling into pits too often and are getting annoyed by starting over at the same checkpoint. You can purchase armor that allows you to sacrifice your health and magic every time you fall instead of dying. One of the most interesting features is having a trial dungeon for each power you buy. The shopkeeper puts you in situations that teach you how to use each power to its full potential. The hub world offers you plenty of laughs and surprises in between levels. Each NPC has their own silly way of interacting with you while offering you goodies such as gold, powers and upgrades. You will never be forced to play the same level over and over forcing you to quit out of frustration. Level select is available right after you complete the introductory stage. Each level is unique. You will never feel like you’re doing the same thing on repetition. The selection screen does a nice job letting you know what collectibles you’ve missed, so if you miss a health or magic upgrade you can simply purchase it with gold after you completed the level. 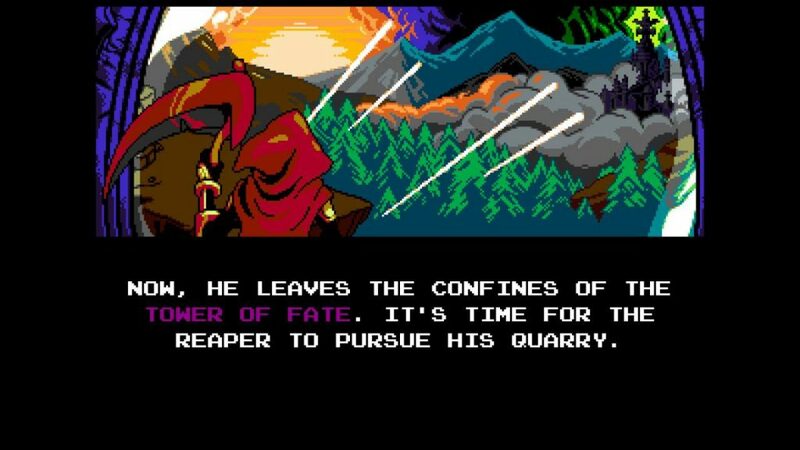 Any fan of the 8-bit era will enjoy Specter Of Torment from start to finish. Yacht Club Games recreates that nostalgic feel that hasn’t really been around in modern games. You are treated to pixel perfect graphics with jamming tunes you’ll want to listen to outside of the game. Simple screenshotted cutscenes tell the story, making everything you remember from older 2D platformers present in this beautifully crafted game. It’s the little details that add up to make an enjoyable experience. You’ll have a smile on your face reading some of the silly dialog. As an evil knight you want nothing to do with an NPC who wants to dance with you. Curios refuses over and over as she continues to waste her energy. When she finally gives up, you unlock the cold shoulder idle stance. It does absolutely nothing but you sure do feel a little villainous. Even the health power ups are of evil design. Instead of the typical fruit or plate of chicken to refill health, you eat chicken bones and rotten apple cores. There is just so much charm hidden all around the hub world and in every level. There are plenty of secrets that are hidden in each level. You’ll easily replay levels trying to find them all while collecting money for more upgrades. The endgame even offers New Game+ and Challenge mode. New Game+ offers a new way to play by combining your health and magic bar. These new meters drain over time and the healing power becomes unusable, setting up new ways to play through each level. You will have to be more cautious about how you maneuver through the levels as there are less checkpoints, monsters do more damage, and using magic drains your health bar. Challenge mode adds a few new trials that test everything you’ve learned. You can even replay the boss fights without having to traverse a level. It’s a nice balance, offering a completely different way to play by adding more ways to die. It’s a humorous prequel filled with classic 8-bit nostalgia in the best way possible. The menus, controls, and music are so charming to the eyes and ears. You’ll find yourself reminiscing games about from the past as you play nodding your head to the tunes. Specter of Torment offers quite a lot for an expansion. 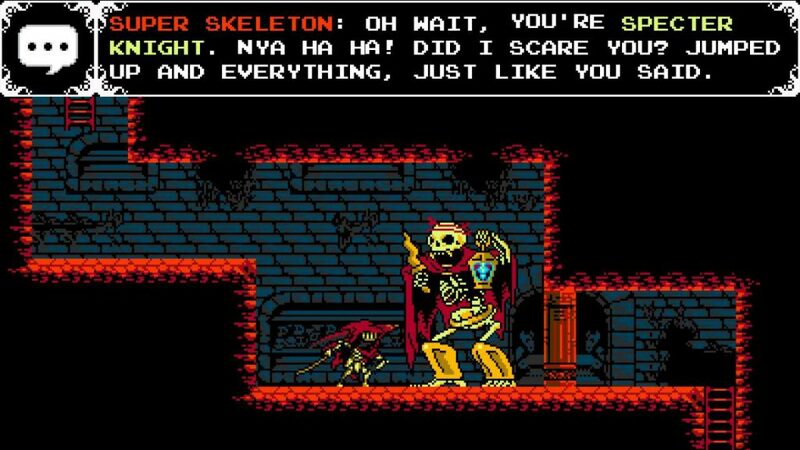 Yacht Club Games offers Specter of Torment as a standalone title or bundled up with the previous titles. As a newcomer you’ll want to add this to your Switch library. If you’re new to the series, we recommended buying the Shovel Knight Treasure Trove bundle which includes the previous two installments and a free upcoming expansion. If you buy Specter of Torment by itself, you’ll have to wait for the other titles to be added to the eShop to be sold individually. The game was purchased by the reviewer on the Nintendo eShop.